Over the past few weeks, 900 Territory middle school students from the Darwin, Arnhem, Rivers and Alice Springs regions have gained “hands on” experience in trades which will help them to decide their future careers. 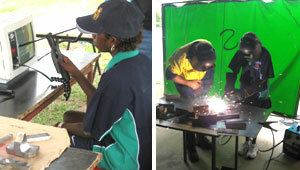 The 2008 NT Try ’a Trade events were held in Darwin, Katherine and Alice Springs allowing the students to interact with professionals and apprentices to gather more information about a range of trades. The Territory was the first to introduce the Worldskills Australia initiative in 2003, in response to the huge skill shortages experienced across the trades. The rest of Australia soon followed after discovering the benefits of introducing specific trade skill sets, study pathways and career information to students while at middle school. For the second consecutive year, the event was held in Alice Springs over two days to ensure that remote students were able to take part, and the event was held in the Rivers Region for the first time. Industry, schools and students have been eager to engage in this type of interactive learning opportunity for some time, and with ongoing commitment from consortium members, Charles Darwin University, Group Training NT and the NT Government Department of Education and Training, it has finally become a reality. Try ‘a Trade is supported by local industry and registered training organisations which donate materials and services, and participate as professional skill coaches to deliver the interactive hands on trade activity.